sequel to Invisible Inkling, with illustrations by Harry Bliss; Harper/Balzer+Bray, July 2012. It's Halloween. Fourth grader Hank Wolowitz hates Halloween. Every year his older sister, Nadia, scares him half to death. This year might be different, though. After all, Hank's the only kid in Brooklyn, probably the only kid in North America, with an invisible bandapat living in his laundry basket. And Invisible Inkling loves Halloween. Pumpkins are his favorite food. 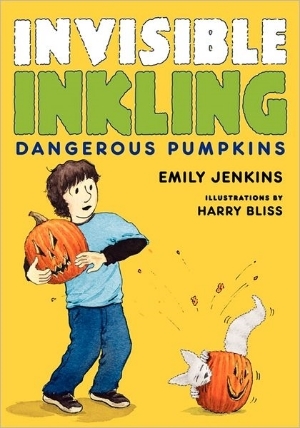 But Hank has serious trouble stopping Inkling from devouring every jack-o'-lantern in their neighborhood. And that's not his only problem: Will he figure out a cool costume? Will he survive the small army of ballerinas roaming the hallways of his building? Will Hank ever get revenge on Nadia? Inkling has long since stopped listening to Hank's worries. Click here for a printable dangerous pumpkin classroom activity. The Saturday before Halloween weekend, carved pumpkins begin appearing on the stoops of brownstones and apartment buildings in our neighborhood. Inkling starts heavy breathing as soon as he sees the first one. We're walking down the block, him on my back, and he's clutching my shoulders with his claws, he's so excited. When we turn the corner, there are six clustered on one stoop. Big ones and small ones, grinning wildly. Inkling starts mumbling to himself. "Ooh, pretty pumpkins. Pretty, pretty pumpkins. Hello, there! How you all doing? You are all for Inkling, aren't you? Just waiting there for my lunch. Yummy yummy!" "Excuse me," I say. "Those are not yours." "Oh yes they are," he says in my ear. "Yummy, yummy. Pretty, pretty." Inkling is riding on my back because he doesn't like to walk around our neighborhood. There are too many dogs and feet. It's dangerous for a small, invisible person. We are going to the corner fruit market to buy some radishes and lettuce for my mom. I bought Inkling a squash there yesterday, like I do every Friday when I get paid -- but it wasn't a pumpkin. Acorn squashes are a lot cheaper than pumpkins. If I buy an acorn I have enough money leftover for candy. "People carved those jack-o-lanterns," I tell Inkling. "They're works of art." "Nah. Look. They're abandoned on the street!" "No, they're not. They're decorations." "It's like I dreamed Halloween would be. Pumpkins, lining the streets of Brooklyn." He starts muttering again. "Yum yum, pumpkins. Oh, little pumpkins, you are just made of yum, aren't you? Yes, you are." Then louder: "Go on, Wolowitz. Get one for me." "Get two. Get big ones!" "I'll buy you one at the store, but you can't eat the jack-o-lanterns on the stoops." "I can't buy it now. I have to buy radishes and lettuce. There won't be any more money. You have to wait until I get paid." I reach onto my back and grab Inkling by the scruff of his thick, furry neck. I yank him around and hold him in front of me. I look where I think his eyes are. "You know I don't get paid till Friday," I bark. "You have to control yourself. You have to!" "Hank?" A voice startles me. "Hank, whatcha doing?" I look up. There is is Joe Patne, a kid from my class. Standing there with his dad and looking at me like I'm a crazy person.